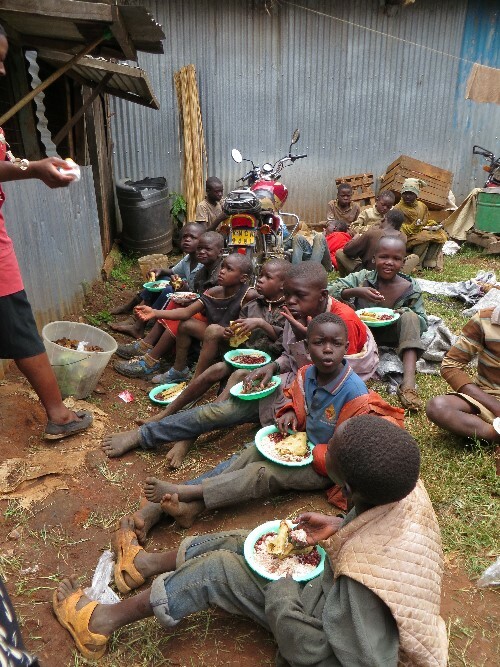 My first experience with feeding the Kitale street orphans. Since returning home from Kenya, the cloak of introspection over my heart and spirit has lingered, deepened even. Combined with a whirlwind of activity to establish a non-profit, officially forming an amazing team to support this new ministry and the upcoming Christmas holiday, there’s been plenty of distractions from blogging. But here it is…the moment of truth. In some way, I know I’ve been avoiding it. Why? Because when I blog, I open my heart and pour it out onto virtual paper; post it for anyone to see. And with that outpouring comes vulnerability and a question. First, the vulnerability. To share about “the need” requires me to revisit my heart-experience as it was during my days in Kenya. The memory that comes first is of my final night. One that started out with great joy and celebration as we shared dinner at Upendo Home with the boys, their incredible guardian family and the community leaders who I was entrusting Upendo with as I prepared to depart. If I did not have such incredible confidence in these amazing people, I would not have been able to leave. But because I do have such confidence, I was leaving, which ultimately led to the moment when joy turned to deep sadness. The time had come to force myself to start the process of saying a final goodbye to my boys; the ones who now called me Mama. Even now, remembering this moment makes me weep and brings about a deep ache in my heart. The boys became instantly sad when they realized the moment had come. I had done my best to prepare them for this inevitability. But I also knew that no amount of preparation would help ease the hurt when the moment arrived; and it didn’t. Though the older boys – Joseph, Arafat and Meshach — better understood what was happening, they were also the ones I had grown closest to over the prior weeks. Saying goodbye to them was the most painful thing I think I have ever had to do. While Joseph was stoic, both Arafat and Meshach were visibly upset. All I could do was to hug them tight to me, remind them of my love and commitment to return, and force myself to take the steps to the van. The moment I was out of their site, the anguish I had been holding back broke loose and I began to weep. The van was full of people, but all that could be heard was my weeping as we pulled away in the darkness. The memory that next comes to mind – and the one that brings me the most restlessness even today — is the Kitale street orphans. It was from this unlimited supply of homeless children that our Upendo boys were thoughtfully chosen. Trust me when I say that though we approached this process carefully, it did not make it easier to rescue such a small number of children from a sea of hopeful faces. The restlessness and pain I feel about the Kitale orphans left behind has not diminished; not one bit. In fact, it has grown and deepened. Every night, I think about how many of them are still on the streets…homeless…hungry….hurting…waiting. Wondering if their day of help is ever going to come. I know there is more that must be done. This leads me to the question. Will sharing all of this fall on mostly deaf ears? This consideration has been the hardest of all. Please don’t get me wrong. We have had a few people catch the vision for what we are trying do and offer their support as they are able. With every pledge of help, my team and I are so encouraged and excited. These benevolent ones are so appreciated. But a few people is not nearly enough. A few people will likely never be enough. And truly, the resources needed to do more on a much larger scale are right here in America. And yet, the plight of homeless dogs often raise thousands of dollars in mere days when orphaned children can barely get a nod over the span of months. I adore dogs. I have a beloved dog. But to witness compassionate comments and donations surge in response to a plea to help an animal compared to a mere whimper of response for orphaned, hurting children is absurd, disheartening and should not be. I am feeble and utterly crushed; I groan in anguish of heart. All my longings lie open before you, O Lord; my sighing is not hidden from you. I wait for you, O LORD; you will answer, O Lord my God. I am feeble. I am crushed. I am in anguish. Yet, I will wait for God. Might He be waiting for you? If you are able to help with networking, sponsorship, a donation or some other way, would you kindly let us know via email to lovewithoutborders@gmail.com. Donations can be made via PayPal to lovewithoutbordersca@gmail.com or via our open Indiegogo fundraiser. Thank you ever so much.